Tip #1 – Cover up the 4 answers before you read the question. Take a look at each of the 6 questions. Which ones would be helpful if your students covered up the answers? Which ones would be impossible? Is this the best strategy for all of your students? Would you use this strategy yourself all the time? Personally, I don’t think I’d ever use this strategy! I wonder what would happen if we told a group of students to do this every time and they encountered questions like #1 or #2 above? We would be setting them up for failure. Hopefully you are seeing this method might not be possible for every question, nor will all students benefit from using it at all! Tip #2 – Highlight keywords in the question so you know what is being asked of you to do. Many teachers might ask their students to highlight pieces of a problem or question in order to help them focus their attention on information that might easily be missed. For the above question, it is possible that some students might miss some of the final words and even though they understand the question, might get their answer wrong. Obviously this isn’t ideal! However, in my experience, many students, even when using a highlighter, miss out on all kinds of information. In the following question, more than half of the students in one classroom answered “d”, even though all of the students were expected to highlight important information. Did so many in this classroom get this question wrong because they were highlighting? In fact, many of the students in this class highlighted nearly every word of every question. And some of the students who didn’t highlight as many questions as were expected – actually did the best on the test. I’m not suggesting that highlighting is bad, just that it likely didn’t help any/many of the students in this class, and actually got some students to miss out on information and get the wrong answers. Tip #3 – Eliminate the obviously wrong answer first. Again, many teachers give advice like this because they know it works for them. Take the following question as an example. Would you first eliminate the wrong answers? Or would you place each of the 4 numbers in the box to see what the answer might be? Or possibly work out the question without notice to the options, then see if your answer is there? If you haven’t already read it, please read my post Quick Fixes and Silver Bullets… There I discuss some of the many unproductive beliefs and strategies many schools employ as they attempt to improve testing score, followed by more productive suggestions. Thinking specifically again about multiple choice questions, there are many different tips we can give students to solve a multiple choice question, but because every question is unique, and every student will have their own thinking and strategies, we might be putting too much emphasis on trying to find the quick fixes and easy answers. Instead of teaching these strategies, I wonder why we don’t just provide students with rich tasks / problems, then encourage more discourse? If we want our students to do well in our classrooms, we need to make sure we are focusing our attention on providing rich learning opportunities, facilitating meaningful discussions, and consolidating the learning effectively! However, in some classrooms I wonder how much valuable class time is spent preparing for high stakes testing by “practicing” questions that mimic ones found on the test? I wonder how much time is spent seeing IF you understand something instead of time spent on actually learning the curriculum standards the way they were intended to be learned? The problem here is that many of these test questions are evidence OF learning, but they are often not the type of experiences needed TO learn the material! 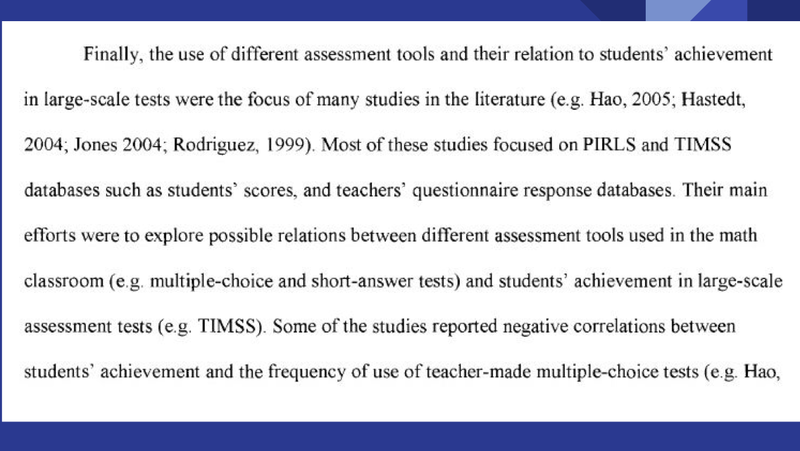 Personally, I’m not a fan of multiple choice questions (see the late Joe Bower’s post for details). In some classrooms there is far too much emphasis on getting right answers on simple questions and far too little emphasis on development of deep understanding of the mathematics! Too many attempt to raise scores by replicating the form and format of the test instead of focusing on the mathematics itself. Yet research shows us the more multiple choice tests we give, the worse our students actually perform on standardized tests! (unless your goals are misguided – like trying to get a certain percentage of students to pass the test – in which case I’m not sure how helpful I’ve been here!). Previous postProfessional Development: What should it look like? Well constructed MC questions are also written so one of the answers (right or wrong) do not stick out. So in that #34 there are two small answers and two large answers. This is ultimately so that if students get the answer correct or incorrect, you can learn something about what they know or don’t know. Like it or not, this is how EQAO constructs their MC questions. They are trying to make sure that if a student get’s it right or wrong it is for mathematical reasons. You are correct! Every answer is considered plausible. There will never be an answer that is completely arbitrary. Having students analyze and reverse engineer distractors intentionally linked to common errors and misconceptions is a powerful and enabling strategy for strengthening conceptual understanding. Great point Jay! Any time we can discuss mathematics together can make for great learning opportunities. Not sure I would tell every student to do this for every question though. *sigh* Here we go again. Testing time is such a drag! I have never used this cover-up strategy, and might share it with my students. However, as you pointed out, there are so many things to consider and there isn’t one magic strategy that will help. I got excited when you said it might help to eliminate guessing because I know this is often a problem for the grade 3’s. A problem looks hard, I’ve told them it’s better to guess than leave a blank, so they guess, and guess, and guess until the test is done.